Corey Johnson ’19, Harvard's best three-point shooter over the past two years, sank three treys to help the Crimson beat Dartmouth 61-51 in its Ivy League opener. Seth Towns ’20 has averaged 13.8 points per game over the last six contests, during which Bryce Aiken ’20, the team's leading scorer, was limited by a knee injury. Stemberg men's basketball coach Tommy Amaker has been tinkering with his starting lineup as he tries to prepare his young team for conference play. At first, the message seemed strange. After a 74-63 victory over Boston University in late December, Stemberg men’s basketball coach Tommy Amaker wrote on the whiteboard in the team’s locker room that the Crimson were 2-0. The team’s record was actually 5-6, but as Weisner Perez ’19 explained, the coach was developing a theme he had introduced after the team’s 79-70 loss to Kentucky. 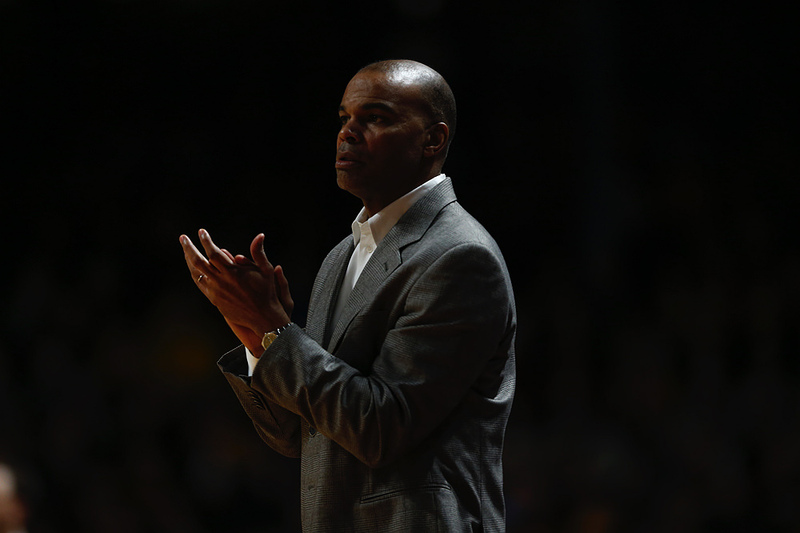 Amaker pointed out that the Crimson had played competitively with one of the best teams in the country and that they should therefore act as though they had a “clean slate” and were 0-0. The BU win—paired with Harvard’s 47-45 victory over Fordham in its previous game—made its record 2-0. Five games later, the Crimson have significant room for improvement. Although Harvard won its Ivy opener over Dartmouth 61-51 on Saturday, the Crimson dropped its final four non-conference games, including yesterday’s 63-62 setback at Wofford College. As the team focuses on Ivy play, it is trying to solidify its lineup and improve its shooting and man-to-man defense. The game notes for Harvard’s late-December contest at Minnesota included a curious tidbit: 16 Harvard players had started a game this season, the most of any team in the country to that point. Although versatility is a virtue, that much turnover hints at challenges. One is illness and injury: numerous Harvard players caught a virus and missed games during a Thanksgiving tournament in California, and Bryce Aiken ’20, the team’s leading scorer, has missed five of the last six games (and played only sparingly against Dartmouth) following a knee injury. But Amaker has also benched his regular starters. Against BU, he started five players who up to that point in the season had played a combined 11 minutes. The coach said that he wanted to reward the players who had competed hardest in practice; he was also sending a message to the normal first unit—which came off the bench later—that he expected them to play harder. The unorthodox lineup staked the Crimson to a 10-3 lead against BU. But the same group fell behind 5-0 in the next game at George Washington, contributing to a 58-48 loss. That loss will not prove too costly if Harvard does reach the NCAA tournament (though its non-conference performance will hurt its seeding). The bigger challenge is whether the lineup shifts and injuries will make it harder for the players’ roles to crystallize; discontinuity can lead to problems on the court—turnovers, miscommunication, and defensive lapses. Another issue is shooting. Harvard is 40.5 percent from the field and 29.5 percent on three-point attempts—the worst in the Ivy League in both categories. Several talented shooters are performing inconsistently. 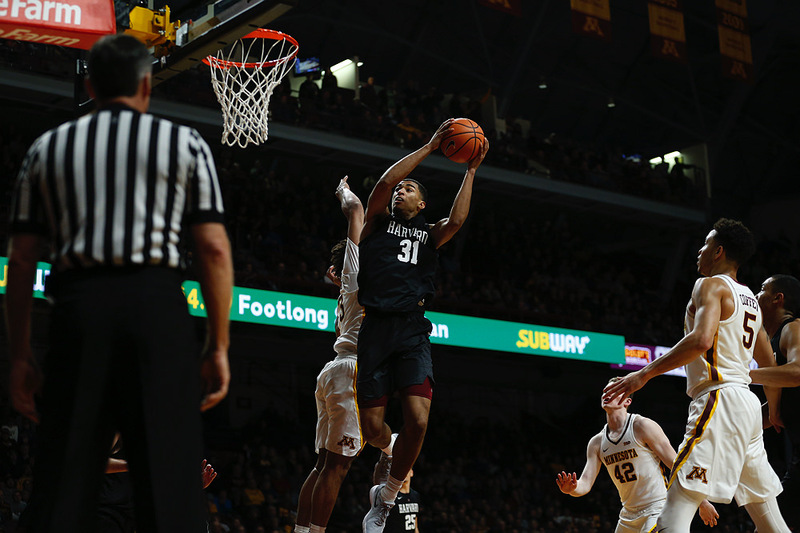 Seth Towns ’20, the team’s second-leading scorer at 13.2 points per game, is Harvard’s most accurate three-point shooter (39.7 percent), but he is shooting just 38.3 percent overall and made only four of 20 field-goal attempts at Minnesota. Corey Johnson ’19, the team’s best three-point shooter as a freshman and sophomore, has made just 34.5 percent of his treys this year. It is possible that being on the road for 10 of 16 contests has contributed to this subpar performance: travel can increase fatigue, and it can be harder to shoot against unfamiliar backdrops. Another variable is the quality of shots. Particularly against Kentucky and Minnesota, the Crimson faced athletic defenses and contested looks. And with Aiken injured, Harvard has been without its best playmaker, who can draw defenses away and open up shots for his teammates. Finally, misses can be contagious, especially for a young team. Against Dartmouth on Saturday, 12 Harvard players took the floor—none of whom were seniors and 10 of whom were freshmen or sophomores. The assistant coaches have been working with the players, who have been putting in extra practice time to work on their shooting. Against Dartmouth, the benefits of that practice began to show, as Harvard shot 12 of 25 three-point attempts, including four down the stretch to pull away. But then the team shot five of 26 three-pointers at Wofford, underscoring the major concern about the Crimson’s shooting. Harvard is allowing just 66.9 points per game, best in the conference. Still, it has some distance to go to equal the level of defensive success that has characterized Crimson teams during Amaker’s tenure. He likes to rely on stout man-to-man defense while occasionally sprinkling in a “point” match-up zone that combines elements of man-to-man defense (where players are responsible for guarding one player) and zone (where players are responsible for defending parts of the floor). This year, the coach has employed far more zone defense. He has also used different types of zones, including a two-three zone (two defenders on the perimeter and three lined up along the baseline). Mixing up the defense gives Harvard more options and makes it harder for opponents to game-plan for the Crimson. But it also suggests that Amaker is not completely confident about his team’s execution of its “point” match-up zone (which is more complex than a two-three) and nuanced man-to-man defense. Against Vermont, the coach expressed frustration with two post players for failing to switch on a screen, resulting in an easy shot for the Catamounts. Similarly, he has noted that the team sometimes has lapses during the half of each game when Harvard is defending on the side of the court away from the Harvard bench and therefore out of earshot from coaches and teammates who can call out assignments. During the week after losing to Vermont, the Crimson focused its time in practice on defensive fundamentals. Then, against Dartmouth, Harvard surrendered just 19 points in the first half and played man-to-man defense the entire game. That commanding performance suggests that the defense can coalesce—and at a critical point in the season. The Crimson now have a little over a week off before a rematch with Dartmouth in Hanover on January 20, the first of five consecutive road games as the team enters the heart of Ivy play. After falling to Dartmouth on the road 63-56 in its Ivy League opener on Saturday, the women’s basketball team finished non-conference play with a 70-61 victory at home over LaSalle on Wednesday. A bright spot for the Crimson (8-6 overall, 0-1 Ivy) is the recent play of Jeannie Boehm ’20: against LaSalle, she had 19 points, six rebounds, three blocks, and three steals. The team returns to action on January 20 at home against Dartmouth. Harvard Hardwood will return later this month with a more detailed account of the women’s season.